The title really does say it all. 12-year-old Morgan Geyser and 12-year-old Anissa Weier stabbed a 12-year-old classmate (name has not been released) Saturday morning in Wisconsin. They stabbed the victim 19 times and left her in the woods hoping she would die. The motive of the attackers was to become proxies of Slenderman and to prove he was real. A fictional character created by the internet. Criminal and psychological experts say they’d be surprised if investigators didn’t find evidence of psychological problems in either of them. On Monday the two suspect were tried as adults with attempted first degree murder. They are facing up to 60 years in prison. Anissa Weier told the police that she first heard of Slenderman on a website called creepypasta and then introduced the site to Geyser. A little background on Slenderman, he is depicted as being unnaturally tall, with very long limbs and/or tentacles that he can adjust the length of. Slenderman blends in with trees, and usually hides in plain sight. The more you know about him, the closer he gets. 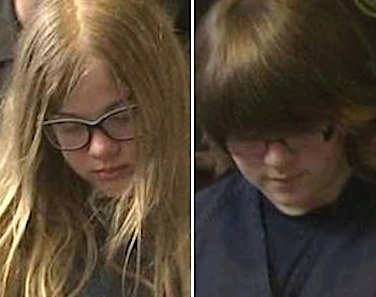 The two girls allegedly started to plan the murder for Slenderman earlier this year. They choose the 12-year-old victim for reasons not yet known. Police say that Anissa and Morgan set their plan in motion Friday when the three girls spent the night at Geyser’s house. Geyser and Weier planned to kill the girl the Saturday morning, at a bathroom in David’s Park. Weier told police that she knew the bathroom floor had a drain that the blood could run down. When the girls got to the David’s Park restroom, Morgan gave the knife to Anissa so that she could hold the victim down, but Morgan had a “nervous breakdown.” The girls then went back outside to play hide-and-seek which turned into the victim fighting for her life. Morgan told police that Anissa was initially hesitant to stab the victim and said, “I’m not going to until you tell me to.” Morgan allegedly replied, “Go ballistic, go crazy … Now.” Morgan said that Anissa then tackled the victim and started to stab her. The victim managed to get up and scream, “I hate you.” She then tried to walk away to a nearby street, but Anissa grabbed her and pulled her back. Anissa told police she asked the victim to lie down and be quiet and told her she would get help, even though she did not intend to do so. Anissa hoped the victim would die so that she could see Slenderman. The two girls believed that Slenderman lived in a mansion. After their attack, they started their walk to Nicolet National Forest in northern Wisconsin where they believed the mansion was. The victim managed to crawl out of the woods, despite her numerous stab wounds to her torso, legs, and arms. A passing bicyclist spotted her and called 911. The victim told authorities she had been stabbed by her best friend, Morgan Geyser. The victim remains hospitalized at Waukesha Memorial Hospital. She is in stable condition. I can only imagine how all the parents feel about what’s happened. The internet can be a very dangerous thing to people who cannot tell the difference from right and wrong. I hope the victim makes a full recovery. The most shocking detail of this story is that the girls are white. Teen serial killers in the United States are almost always black. The ages of these girls is so shocking and saddening I cannot figure how things like this happen. Slender Man seems like the stuff of nightmares but not a cause for murder. Usually we “blame” material like this for killings and now that it’s been cited as a true reason I still feel like it’s the individual but in this case their brains are so underdeveloped I’d need more information from the police and a psychoanalyst to explain what really happened.